We have a great range of practical and novelty keyrings at TAOS gifts including this unusual little novelty handbag shaped speaker key ring, it’s compatible with most MP3 players and mobile phones. It has surprising high quality sound for such a miniature speaker! It comes on its own handy keyring so you can easily take it everywhere you go! Quick and easy to recharge via USB cable (included) on your PC or Laptop, an ideal novelty gift for any music lover. There’s more music on the move with the Drum Pro Mini Arcade Game Keyring. A small version of the retro arcade game, fun at your fingertips! There are three different levels to choose from, wait for one of the pads to light up and hit it! With flashing lights and music it’s a fun little gadget you can take anywhere. The Mini Dance Mat Challenge Keyring is a very similar game with a pretty pink design, simply push the button as soon as it lights up and see if you can keep up! For those that like a quieter, more challenging game, try one of our mini Sudoku Puzzle Keyrings. Each book comes fixed on a keyring and has 24 pages of Sudoku puzzles with the answers on reverse. Carry your Zodiac sign wherever you go with one of our pretty little Crystal Horoscope Keyrings, each has a prism effect, encaptured in the middle of the glass is a pretty Zodiac picture with chosen star sign printed on it. The crystal is approximately 2.9cm x 1.3cm x 0.9cm and all the star signs of the zodiac are available. Perfect for lovers, an ideal gift for your soul mate, a small symbolic token of your love is shown with the two-part Duo Love Face Split Stainless Steel Keyring. Keep one half, and give the other half to your loved one, be together even when you are apart. 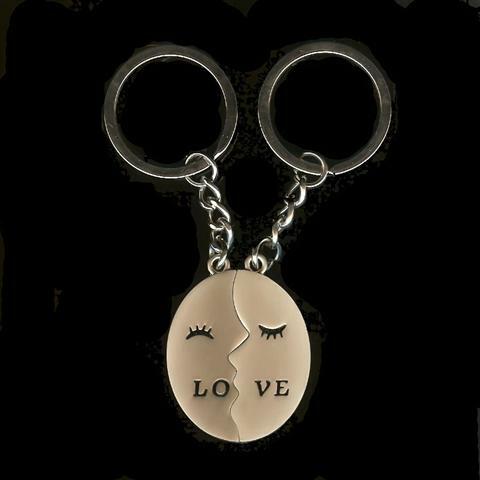 Two half face key rings join together with a kiss and spell out the word LOVE. Supplied in a stylish black presentation gift box making it an ideal gift for Valentine’s Day, a Wedding Anniversary or Birthday Gift. There is also a Teddy Bears Love Keyring, two halves come together to make one whole, a simple, and quirky way to symbolise the way you feel about that someone very special. Have you ever got to the supermarket only to realise you don’t have the pound coin you need for a shopping trolley? Save yourself the frustration of searching for change with a handy Trolley and Locker Token Keyring. A sturdy keyring with a strong lobster clasp clip that holds a disc the same size as a £1 coin. The dis is quick and easy to release to be used in any slot designed for a pound coin, ideal for gym lockers, trolley lockers and shopping trolleys. There are other designs available in the Keyring section of our shop. If you have to carry numerous keys around with you and need to share them quickly and easily our Multi Use Interchangeable 4 way Split Keyring could be just the solution you need! 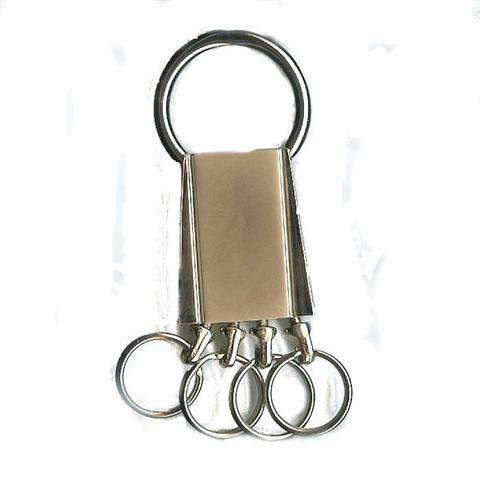 Four individual keyrings all connect into the one main keyring, each ring can be removed in seconds at the click of a button. Great for when you need to take extra keys out with you, or give to someone for a short period. It’s supplied in a black presentation box making it an ideal gift for landlords, parents, club managers, office workers, anyone that needs to carry and share keys on a regular basis. Shottles are a fun and funky way to keep warm and cosy, they look like hot water bottles with knitted covers, and they are just as warm and cosy but far more practical. No more messing around with boiling hot kettles, or rushing to the microwave to heat your heatpack, just click the little disc inside your Shottle a chemical reaction solidifies it and it heats up instantly! Shottles stay warm for up to 45 minutes thanks to their own personal knitted covers, once your Shottle has cooled down, simply reset it by removing the cover and placing the bag in boiling water for a few minutes, then your Shottle is ready to use whenever you need it. There are a whole range of fun and funky Shottle Designs to choose from, The Cream Heart Shottle is a handy heat pack inside a cream knitted cover with a red love heart design. A Perfect gift for a loved one to keep them warm, and make them smile with the romantic, symbolic heart. The Funky Rainbow Stripe Shottle is a bright and lively design to suit anyone, boys, girls, young or old, they are sure to love their instant warming heat pack. Ideal for sports enthusiasts, keep them in your pockets while watching a game, or keep in your kit bag to warm up after an event. They are also very useful to keep in your first aid cabinet, heat packs are an effective drug free pain relief remedy, soothing aches and pains all over the body. Shottles are also available in a handy mini size novelty key ring. As well as being fun and novel gifts they are small,fully functional mini heat packs, as soon as you start to feel chilly, just click the metal disk inside your mini shottle and you’ll have an instant heating system inside your pocket, or gloves. mix and match your Shottle gifts, each mini Shottle key fob has a matching medium size Shottle available. Medium size Shottles measure 21cm x 21cm x 2cm, perfect pocket-size! If you love the great outdoors you will soon wonder what you ever did without your Shottle, ideal for camping on those colder days and nights, and simple to recharge on your camping cooker or camp fire, just boil a pot of water and your Shottle is ready to use again in minutes. If you are looking for the ideal gift for anyone that spends a great deal of time outside a Shottle is perfect! Dog walkers, Fishermen, Hikers, Star-gazers, Cyclists, Football players, Rugby players, Campers, Kayakers, the list is endless. Shottles are also ideal for young children and the elderly, with no risk of scalding, leaks or spillage they are so much safer than a traditional hot water bottle, and with their cosy knitted covers they are soft and gentle on delicate skin, giving instant soothing heat whenever needed. 20 Years of Sonic! This Hedgehog is unstoppable! Did you know the worlds most popular Hedgehog was 20 years old this year? Next year this speedy little character turns 21 and he’s as fast as ever! At TAOS Gifts you’ll find a great range of Sonic the Hedgehog products from Blueprint Stationery. Every Sonic fan will love the Sonic the Hedgehog Rucksack, featuring Sonic and Tails, this handy backpack has adjustable padded straps so it’s comfy to wear and can be adjusted to fit most sizes. Ideal for school or short breaks away. It has a large zipped opening as well as a small zipped pocket. It has a strong loop for it to be hung tidily away on a clothes peg, but best of all it has a large brightly coloured Sonic and Tails design! To run as fast as Sonic, you have to train hard! For your little sporting Sonic fan we have a perfect Training Kit Bag, ideal for swimming gear, school PE kit or for storing trainers in, with vents to let the air circulate and totally wipe clean its ideal for carrying their kit. Printed with a bold design of Sonic and friends posing with attitude! Complete the look with other Sonic the Hedgehog accessories! Keep your money and other small belongings safe in style with the tough Sonic the Hedgehog Velcro Wallet. It has plenty of pockets to keep dinner money, change, membership cards etc safe, and closes securely with a big Sonic face velcro backed fastener. The Sonic the Hedgehog Rucksack is also perfect to carry stationery around in and with our fabulous range of Sonic the Hedgehog Stationery and Giftsyou are spoilt for choice! The Triple Tier Filled Pencil Case featuring Sonic the Hedgehog comes fully equipped with everything you’d need for school or home projects. Layer 1 contains a Sonic design pen, pencil, ruler, eraser and handy notebook. Layer 2 contains 14 assorted coloured felt tip pens and layer 3 contains 14 assorted colouring pencils all with a Sonic design in a brilliant wrap around storage case with fabulous Sonic the Hedgehog images. The ten colour multi pen is a great novelty gift that’s also practical for various work, home or school projects. It’s fun to really make your work stand out with a colourful theme while using this brilliant Sonic the Hedgehog design chunky pen, simply slide the colour coordinating tab down to select the colour you want to work with. Do your homework Sonic style! Get started with the Sonic the Hedgehog Stationery Set, it contains a ruler, ballpoint pen, pencil with Sonic face eraser topper and pencil sharpener, a perfect small gift for Christmas, Birthdays or to add to their back to school essentials. Combine any of the above with the A5 Hardback Spiral Notebook with the Awesome Sonic design and even the most reluctant student will soon be keen to get started! See Our Sonic The Hedgehog Shop for more super Sonic Stationery. Other Characters are also available.